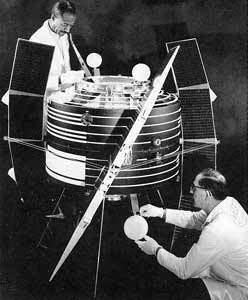 The RAE A (Radio Astronomy Explorer A) spacecraft measured the intensity of celestial radio sources, particularly the sun, as a function of time, direction, and frequency (0.2 to 20 MHz). The spacecraft was gravity gradient oriented. The spacecraft weight was 193 kg, and average power consumption was 25 W. It carried two 750-ft-long V-antennas, one facing toward the earth and one facing away from the earth. A 120-ft-long dipole antenna was oriented tangentially with respect to the earth's surface. The spacecraft was also equipped with one 136 MHz telemetry turnstile. The onboard experiments consisted of four step-frequency Ryle-Vonberg radiometers operating from 0.45 to 9.18 MHz, two multichannel total power radiometers operating from 0.2 to 5.4 MHz, one step frequency V-antenna impedance probe operating from 0.24 to 7.86 MHz, and one dipole antenna capacitance probe operating from 0.25 to 2.2 MHz. RAE-1 was designed for a 1-year minimum operating lifetime. The spaecraft tape recorder performance began to deteriorate after 2 months in orbit. In spite of several cases of instrument malfunction, good data were obtained on all three antenna systems. The small satellite observed for months the "radio sky" in frequencies between 0.2 and 9.2 MHz, but it was subjected to the continuous radio interference coming from our planet, both natural (aurorae, thunderstorms) and artificial. To avoid the radio interference, the follow on RAE B mission was put into lunar orbit.